The game series name is based upon the Saint Crispin's Day Speech, from Shakespeare's Henry V. These are some of the words that the bard puts in Henry's mouth the day of the battle. That fought with us upon." Sorry, I know everybody knows it, but it still puts a lump in my throat. This game follows the 11th Panzer division through four years of war on the East Front. The divisions first commander was Crüwell later of Afrika Korps fame. The original troops of the division came from Silesia in Germany. This is the part of Germany that Frederick The Great stole from the Hapsburgs, and fought two wars to keep (War of The Austrian Succession, Seven Years War). The game is on a tactical and squad level. The system is meant to replicate reality on the World War II battlefield without burying the player in a ton of rules. The rule book is set up to give you all of the rules, but also tries to show and walk you through any instance that may appear in the game. "Based on years of research, the game system uses a unique suppression mechanic. There are no longer two unique states for a unit, but varying degrees of suppression. This allows suppression to accumulate from multiple fire sources and means that the unit will not take take a morale check until it is asked to do something. 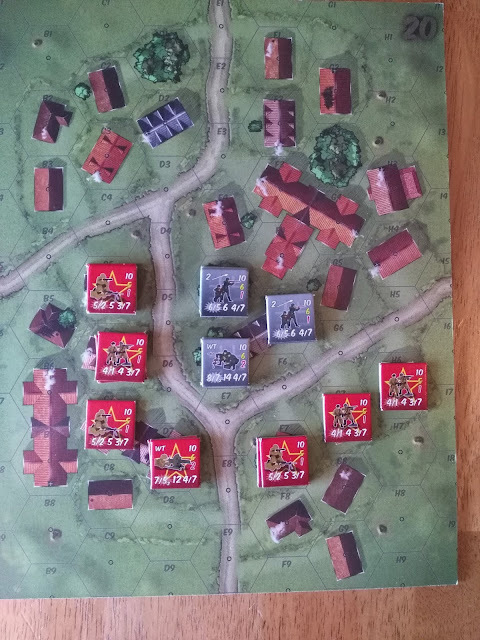 You will never know for sure how your units will respond until they are needed"
So the game focuses much more on the morale side of battle rather than focusing on just casualties.This also increases the fog of war. So not only do you have to guess what your opponent is doing, but also wonder if your troops will follow orders. 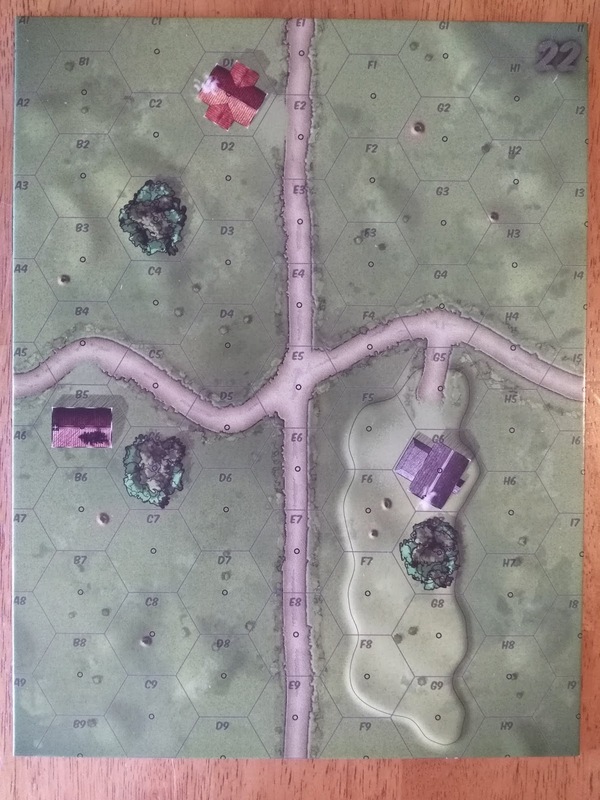 The game comes with seven double-sided geomorphic maps that are 8 1/2" by 11". The hexes are large and are meant to represent forty yards across. The maps can be joined in all different ways to represent the battlefield being played on at the moment. The unit counters are large, at 7/8 inch in size. 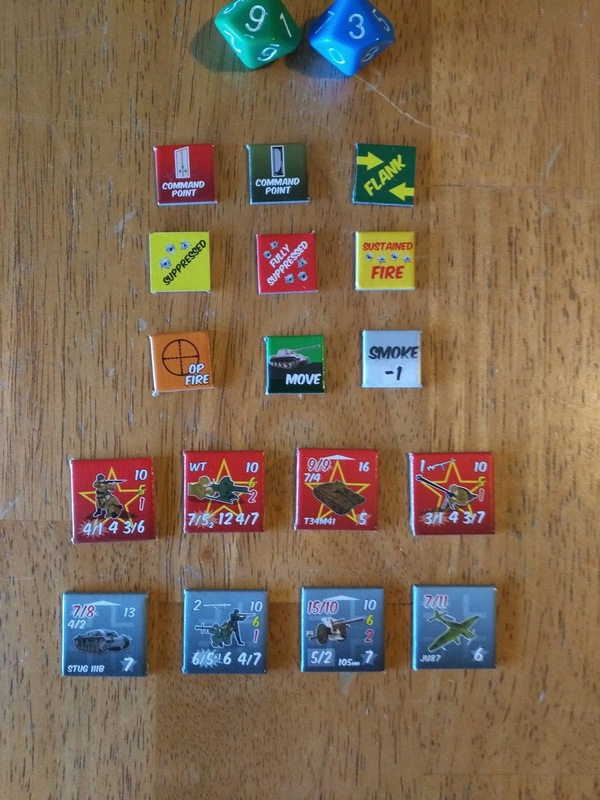 The action counters are 1/2 inch in size. The illustrations on the counters are well done, and represent infantry, tanks, planes etc. The numbers and other info on the counters are also large and easy to read. 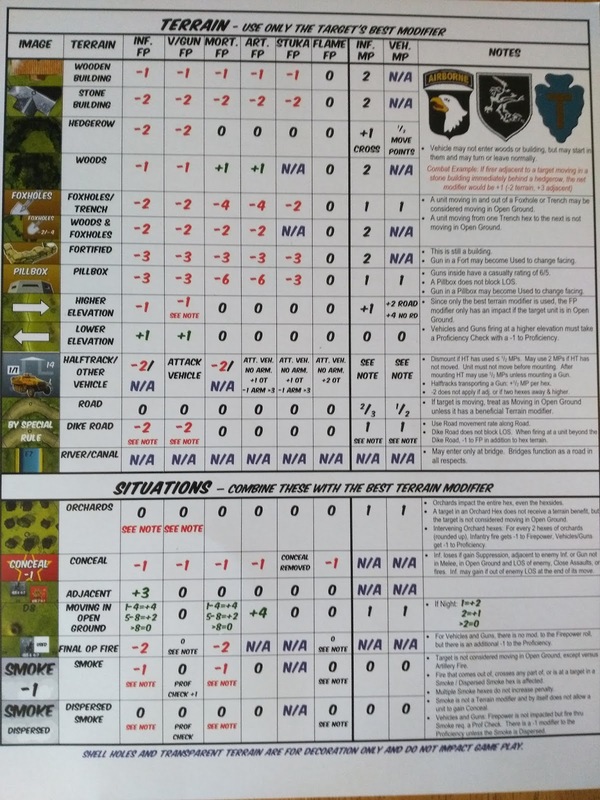 The game comes with two player aid cards that have the terrain charts and situations chart on the back. The rule book is twenty pages long. It has two pages of play examples in it. There is also a glossary and an index of the rules. The scenario booklet is just as nicely done. All of the booklets and the aid cards are in color and are relatively easy to read. It would have been nice to see the rule book in larger print, but it has so much in it that it would then end up to be thirty to forty pages long. I have seen people posting about how long rule books make them not look at the purchase of a game, even if the game might interest them. So, this might have been for the better. The rule book is this long because it is for the whole series of the 'Band of Brothers' games. So if you learn or have the rule book for one game you now know the whole series. 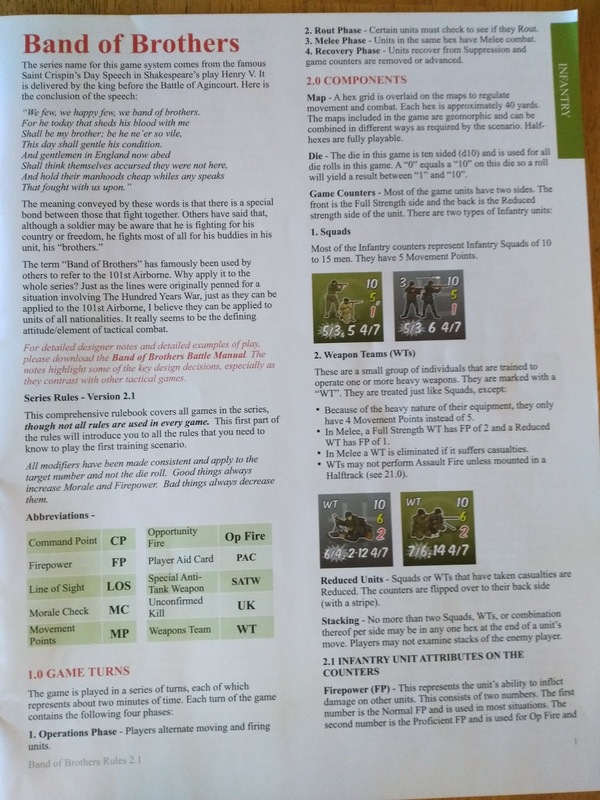 The scenario booklet comes with fifteen scenarios. As mentioned, the scenarios cover most of the war so the player gets to use a plethora of equipment on both sides to experiment and play with. One good thing about the counters is there a lot of them. One bad thing about the counters is there are a lot of them. The counters are large and thick, which is nice, unless your are trying to cut them away from the cardboard sprue. You will definitely get a workout of your scissor hand. Special Anti-Tank Weapons: Piats, Panzerfausts etc. So as you can see, the game has all of the bases covered as far as what could or did happen on the battlefield in World War II. As I have mentioned before in another review, tactical wargames are the toughest to get right. One can know how far a man can walk or run with a pack or certain weight. One can also know how far a weapon can shoot reliably and accurately. It is the time and other variables that make or break a tactical game. I might also add that the designer of a tactical game is playing to a rough crowd. In my almost fifty years of gaming, and reading about gaming, and listening to gamers grumble (hence our title grognards), tactical games, especially World War II tactical games, for some reason bring out the fightin' words in gamers. Every designer has an idea in his head of how tactical combat works. They base it on Dupuy or any other number of pundits on the subject. It is almost like they are directors of a movie or a playwright. The question usually comes down to: is it believable? I think the more important question is: is it fun? Is this game something you want to spend a few hours or more of your precious life playing? 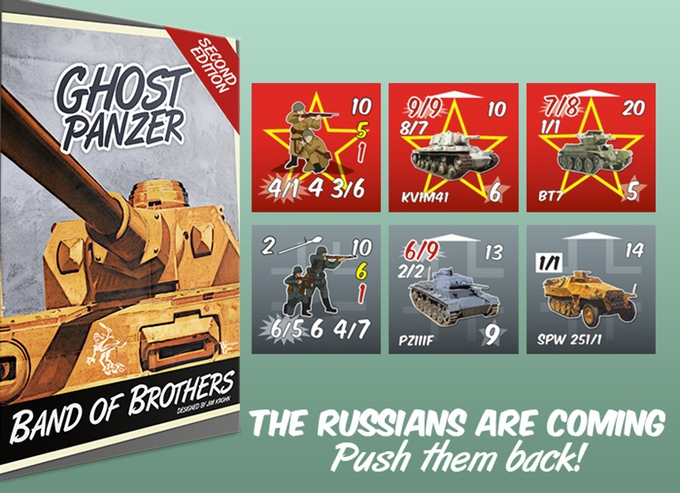 To me Ghost Panzer answers both those questions as a resounding yes. I believe that the rules give you a good representation of the tactical battlefield of the time. It also plays quick and is really fun. 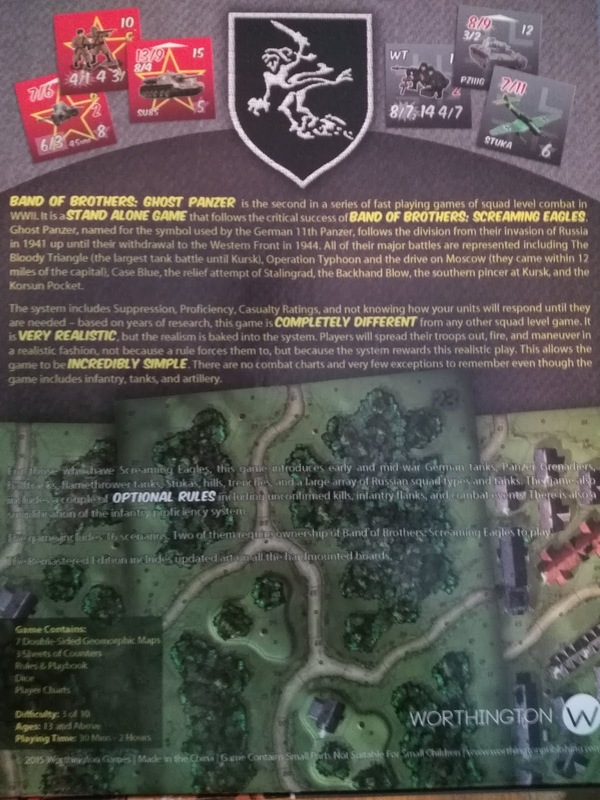 So, to you grognards, take a chance on someone else's vision and check out the Band of Brothers line. 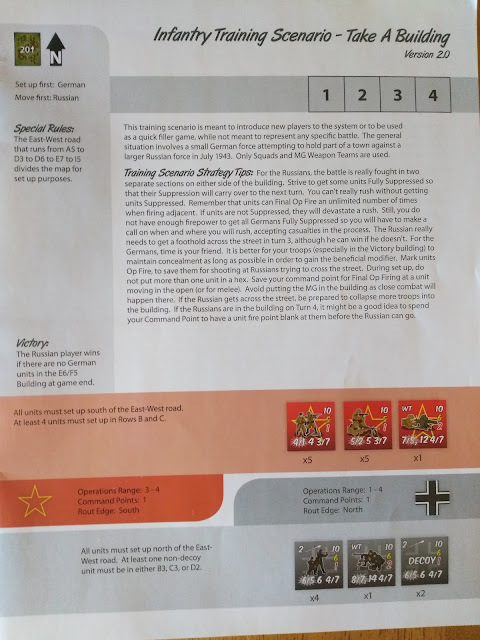 I have reviewed a good number of Worthington Publishing games and have never been unsatisfied. Going by the other reviews and their scores on BGG, I am not the only one by far.